The holidays will be a little brighter for hundreds of abandoned animals without forever homes who are waiting in a local refuge for a second chance at life. American Humane, the country's first national humane organization and Chicken Soup for the Soul Pet Food delivered a ton of love in the form of much-needed nutritious food to abandoned animals being temporarily housed by rescue group Animal Aid USA at Camp Animal Aid in Blackshear, Georgia. This is the latest donation in an ambitious national campaign called "Fill-a-Bowl… Feed-a-Soul™" to help care for shelter pets waiting for their forever homes. Together, American Humane and Chicken Soup for the Soul are distributing more than one million meals annually of all-natural Chicken Soup for the Soul Pet Food to U.S. shelters and pet food distribution centers, which house, feed and care for millions of animals each year. "We are tremendously grateful to American Humane and Chicken Soup for the Soul for this generous donation," Karen Talbot, the founder of Animal Aid USA, which has rescued nearly 30,000 abandoned animals and continues to rescue more than 300 a month, said. "This donated food will help sustain and brighten the holidays for many animals who do not yet have a forever home." "This campaign helps animals when they need help most," Robin Ganzert, PhD, president and CEO of American Humane, said. 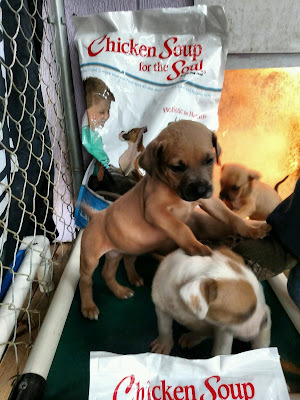 "For what they are doing to help these pets during the holidays and so many more who need and deserve our help and love all year round, a big thank-you to our friends at Chicken Soup for the Soul." Chicken Soup for the Soul Pet Food CEO Chris Mitchell said, "We're pleased that we can provide assistance to animals in need and we are glad to be working with American Humane on this vital campaign that will save so many lives." American Humane is the country's first national humane organization, founded in 1877. Through its rescue efforts and programs to help ensure the welfare and humane treatment of animals, the nonprofit positively touches the lives of one billion animals each year. To support American Humane's lifesaving efforts, please visit AmericanHumane.org. A portion of all proceeds from the sale of Chicken Soup for the Soul Pet Food goes to help shelters and pets in need through Chicken Soup for the Soul's Fill-a-Bowl … Feed-a-Soul™ program. The program, which was launched in association with American Humane, aims to provide over a million meals to shelter pets annually. Visit chickensouppets.com.